V.S. Naipaul's stated subject for his new travel book, The Masque of Africa (Knopf, 241 pages), is African belief. But the book has a second, unspoken theme: a master still at his craft. It takes all of 11 words for Naipaul to remind us just how long he's been doing this. He is back in Uganda after 42 years. In 1966, for six months, he was the writer in residence at Makerere University in Kampala, the capital. His career would eventually span some five decades and include 15 works of fiction, 11 travel books, three extended essays on writing, one history book and one collection of letters. The quality of Naipaul's writingsimple, concise, engagingrarely varies and earned him a Nobel Prize for Literature in 2001. It is his themes and subjectsthe postcolonial pessimism that pervades A House for Mr. Biswas and A Bend in the River, the forensic study of Indian poverty in India: A Million Mutinies Nowthat cause consternation. At best, his accusers say, the Trinidad-born author is a reactionary, at worst an imperialist and a turncoat. His arrogance and selfishness, particularly toward the women in his life, are well documented by ex-friends and biographers. The Masque of Africa does not address these controversies. 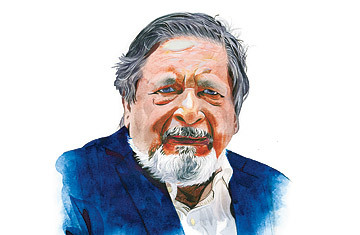 But because it is his first piece of writing in six years, it will inevitably be seen as a riposteand, since Naipaul is 78 and often talks of retiring, perhaps a final one. Ancient African religion is not, on its face, a promising subject for such an enterprise. Naipaul's finding that old beliefs die out is as unsurprising as it is gloomy. But the obscurity of his inquiry makes it fresh. Revelations include the origins of mumbo jumbothe Anglicized name of a West African phantom who would intervene in polygamous relationships to keep quarreling wives in lineand the genesis of methadone in a narcotic plant used by Pygmies in Gabon. In South Africa, Winnie Mandela tells him she solicits advice at the graves of her ancestors, a defiant expression of the African faith she says her former husband betrayed. There is plenty here for critics looking to be outraged. Africa's growing, healthy population might seem a success to aid workers, but to Naipaul, appalled by urban sprawl, it is "a calamity." In Ghana he laments the "difficulties" modernity creates for traditional practices. "Slavery, for instance, is now outlawed," he writes, "and parents can no longer sell or give their children to a shrine, to pay off a debt." But if detractors are upset by his sentiments, they will be infuriated by the writing. Like Flaubert and Hemingway, Naipaul uses less to say more, and here he has few equals. He describes a modern church in Kampala as "architecturally adventurous (in the oil-refinery style)." The loss of old African ways "was like dealing with a very long illness. It announced itself one day, and you dreamt then of waking up well one morning. Gradually... you made your peace, so to speak, with your illness ... It became all you knew; it became life." Above all, Naipaul's latest African journey is eyewitness reporting at its best. He is not claiming to be right; he presents himself as a highly subjective observer, often tired, ever fretting about tips and oddly obsessed by the welfare of kittens. But he was there, he seems to say, and this is what he, Naipaul, found. That gives the writing a texture, honesty and ground truth that makes high-minded criticism ring somewhat hollow. At the neglected tomb of the 19th century warrior-king Sunna, Naipaul writes that it seems sure to be soon engulfed by the slums of Kampala. "Against that ordinariness, which consumed everything, there was no defence." Not something, even on his 30th book, ever likely to be said of Naipaul.